A Shepherd's Heart: Please Join Me In Praying for The USA! Please Join Me In Praying for The USA! Love and God changing the dark hearts of mankind is the key. I saw this image today and with all that the US is facing, I wanted to share it and ask you to join me in praying! So many deaths. :-( My heart is aching for the USA and specifically those directly impacted by the lives taken and those injured. It saddens me that racism still exists and specifically it seems several deaths are the result of this. It also saddens me that several police officers have died this week...all the deaths for nothing. Enough already! I can't help but think that death for death doesn't make anything better in these cases an the problem in our country goes far deeper than the news outlets, politicians and others spin. God please move on the hearts of the people in our nation. Bring us wisdom, reconciliation, justice and somehow - peace. Help us to love others as You first loved us. Help us to be a part of the solution and not part of the problem! To my friends and family, no matter the craziness that is taking place in our country...please know that without a doubt, I care about you and you're loved by me. Life is too short and you and I may never have the opportunity to tell one another how much we care...so...this is my notice to you! My heart aches with you! Please join me in prayer and working to be a part of the solution not the problem. I stand in agreement with you Randy! The news is too heartbreaking to even watch anymore. We have enough worries with terrorism. We don't need to add another civil war in our own country. Praying with you. God calls us to make love a verb. 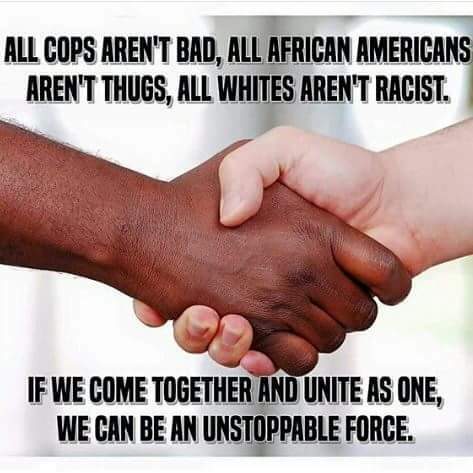 United we stand, divided we fall.